Today's post is a long way from a July 4th project! I've inundated your inbox with red, white and blue DIY projects recently, including my easy patriotic pinwheels and my Fourth of July mantel. I'm ready for some pink, how 'bout you? This project couldn't be simpler. Don't believe me? Read on for the details and all the instructions! I've had my wire trash can for years now, and been frustrated with its functionality for just as long. I bought it because it's cute. 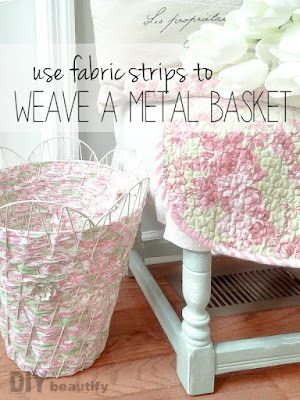 BUT...unless an open-weave basket or trash can comes with a liner, it's really hard to keep it cute. Stuff keeps wanting to fall out...or get stuck in the holes! If you line it with a trash bag, then it just looks ugly. 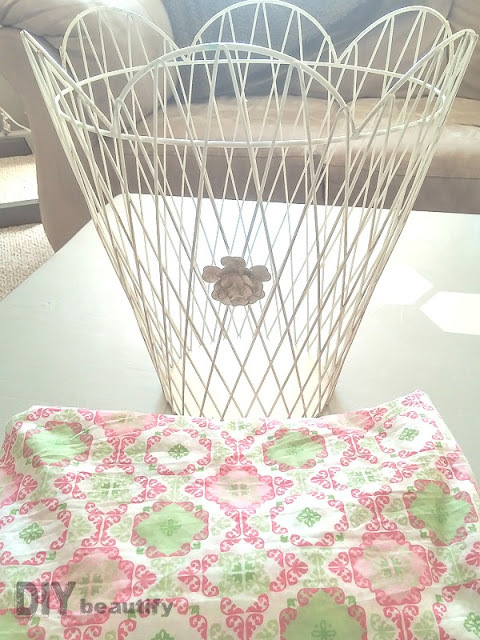 I set out to make a permanent, solid basket that still looked cute, using just strips of fabric. This is a NO GLUE project! You don't even need scissors! a yard or so of fabric - I used a twin sheet but wouldn't this pink and green buffalo check* look cute too? 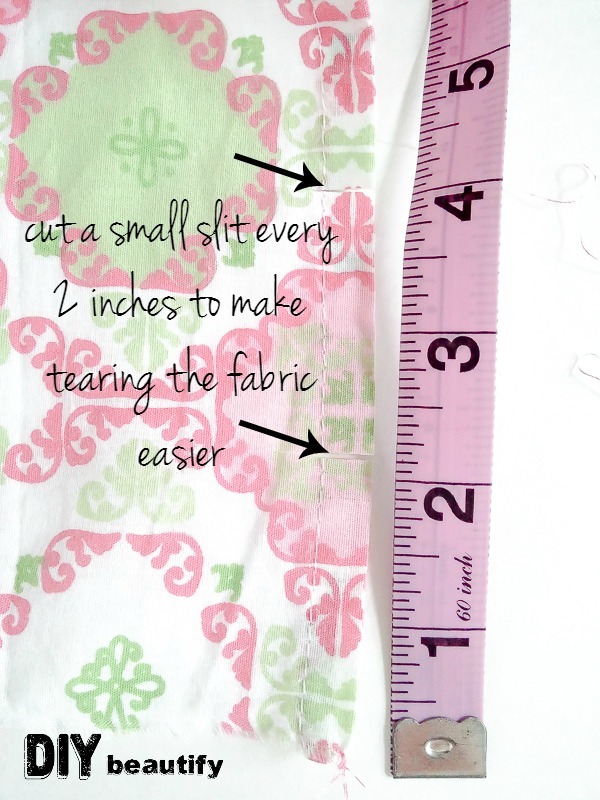 TIP on fabric choice...lighter, thinner fabric will be easier to weave than thicker, upholstery-like fabric! 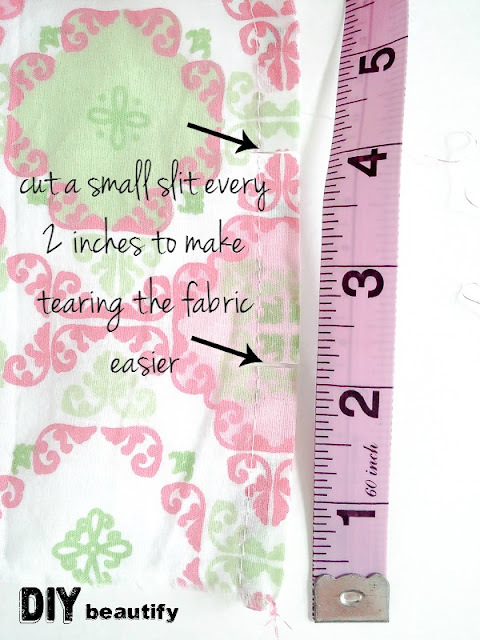 wash and dry your fabric first! remember...you want to keep all the knots on the inside! 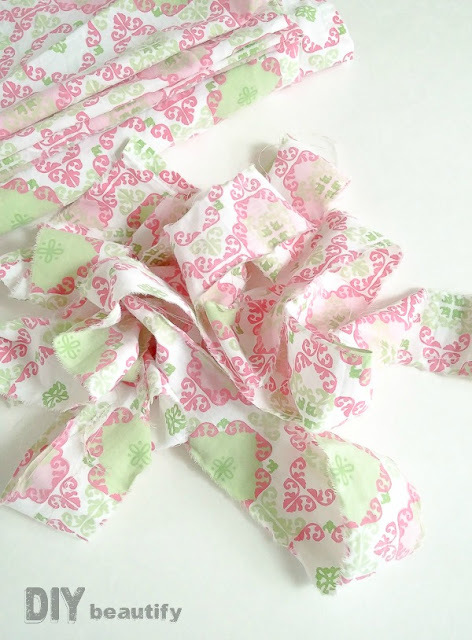 The fabric I used kind of has a Lilly Pulitzer look, doesn't it? Now when I insert an ugly plastic grocery stack to protect my beautiful woven basket, no one will see it! It wasn't until I'd finished that I realized I had a lap quilt in the same shades of pink and green! It's almost too pretty to use...almost! 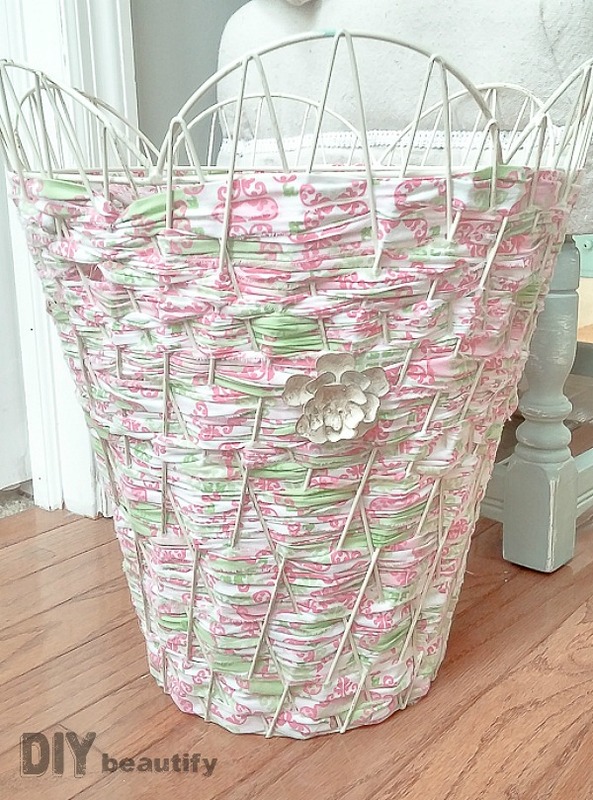 There are so many gorgeous fabrics available at Hobby Lobby, even Walmart...pick one that matches your decor for a custom trash can like no-one else! You'll need maybe a yard or so. Or make a set of matching baskets for your office supplies using wire baskets*...they would look so cute sitting on an open shelf! I love pink white and green. So pretty! I agree Kerryanne, I love this combo too! Thanks so much for the feature!! I originally saw t his on Hometalk and fell in love with it. Perfectly matches thecomforter too! And of course it is much more practical than having all those holes! Fantastic job! Thanks Mary, yes...way more practical this way, lol! I sure was inspired! Pretty and practical!